Welcome to our review of the Ultimate Arms Gear 4×32 Dual Red/Green Illuminated Crossbow Rangefinder Reticle Hunting Scope. This scope is an inexpensive option for an illuminated third-party scope, but don’t be mislead by the advertised ‘rangefinder’ reticle. The reticle is simply a multi-plex reticle that allows you to aim at different ranges ‘ 20, 30, 40, 50, and 60 yards. This scope weighs 9.3 ounces, so it adds a bit more than half a pound to the weight of your crossbow. Not bad! It’s a compact 8.25′ long and a bit more than 2′ wide at its widest point. The 1′ tube diameter will work with most standard rings, but the scope includes a set of mounting rings for convenience. This is a pretty compact scope, and shouldn’t take up much room in your crossbow case. How Much Magnification Do I Get From the ? 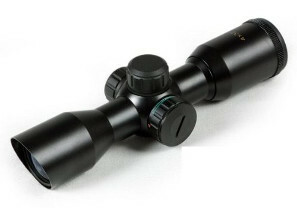 The Ultimate Arms Gear 4×32 scope provides a fixed 4X magnification to bring the target closer to you. The tube is nitrogen-filled, which reduces fogging, and the optics are multi-coated. This scope is fogproof, water resistant, and shockproof. The reticles are glass etched and are dual illuminated in either red or green, with multiple reticles for ranges from 20 yards to 60 yards. This is what Ultimate Arms Gear means by ‘Rangefinder Reticle,’ so don’t be expecting an actual rangefinder built into your scope. The scope is just a standard multi-range scope with reticles for different ranges. The light-gathering capability of this scope is nothing short of amazing. I was able to use this scope in very early daylight hours, even under overcast conditions. The illumination on the reticles is easily adjustable, so you can get just the right level of red or green light for your personal preferences and the lighting conditions. The first trip with this scope, I spotted a buck just a few minutes after dawn, when the lighting was still very poor. He was about 40 yards out, but I could see him clear as the height of day with the Ultimate Arms Gear scope, so I took the shot and bagged him. From a hundred yards, I estimated the field of view to be right around 27-30 feet. The specs for this scope say the field of view is 28 feet at a range of 100′, but I suspect the manufacturer meant to say 100 yards there (since that’s the typical way of measuring field of view). Needless to say, the scope has a field of view that is above average for a 32mm scope with 4X magnification. As long as you have a 7/8′ Weaver or Picatinny rail, this scope is quite easy to mount, since the rings come along with it. What you might find yourself needing, though, is a 1′ offset mount, if you find sighting in the elevation to be an impossible task. My recommendation is to buy the offset mount and return it if you don’t need it; I needed it on 3 of the crossbows I tested this scope on. How Easy is the to Sight In? I started off testing this scope on a Barnett Quad 400. Windage was almost dead-on, but I had to adjust the elevation all the way to its stop point and was still shooting low. After a talk with Ultimate Arms Gear, they recommended a 1′ offset riser, so I ordered one and tried that. Sure enough, the 1′ offset allowed the scope to sight in perfectly and within just a few shots. Some purists might say you shouldn’t have to do this, but the fact of the matter is that crossbows have such widely variable speeds that I’m not too surprised by needing the offset mount. Once sighted in, the scope held zero for a full hunting season and beyond. I’m confident that this scope would hold zero almost indefinitely, or until it was removed from the crossbow and put on a different crossbow. The outside casing of the Ultimate Arms Gear 4×32 scope is a rubber composite, and the scope is fairly shockproof. It’s also weatherproof and waterproof, so this is definitely a durable scope. I’ve had this baby out in very poor weather conditions, and it’s performed perfectly no matter the weather. Thanks for reading my review of the Ultimate Arms Gear 4x32 crossbow scope. This is an excellent value, since it allows for shooting out to 60 yards and is illuminated. The optics are very clear and crisp, and the durability of the scope is second to none. I would recommend ordering the offset mount if you're in a hurry to get the scope up and running, but other than that requirement I have absolutely no reservations about recommending this scope for any hunting or target use.